An absent P wave suggests that the rhythm is not a sinus rhythm. This can be difficult to detect as P waves can sometimes be hidden in the waves before or after them, and sometimes they are very small and hard to see – especially if there is baseline artefact. This ECG is from a middle-aged man who presented with chest pain, tachycardia 130 bpm and BP 50/30. He was alert but cool and clammy. His background was unclear, but he mentioned chronic dyspnoea, 'cancer' and 'chest'. Fluids were started. This was his initial ECG. This ECG is from a middle-aged man who presented with chest pain, tachycardia 130 bpm and BP 50/30. He was alert but cool and clammy. His background was unclear, but he mentioned chronic dyspnoea, 'cancer' and 'chest'. Fluids were started. This was his second ECG, on arrival at hospital. Potato Poisoning (Not due to Solanine in greens!). With Positive Modified Sgarbossa Criteria. This ECG is from a male of unknown age who presented with progressive weakness over 3 days, on a background of haemodialysis, cardiomyopathy, diabetes and hypertension. This ECG shows wide QRS complexes with peaked T waves caused by hyperkalemia. 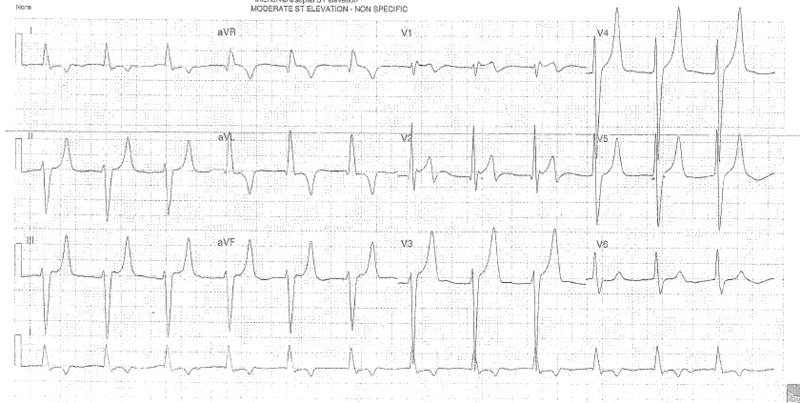 This ECG is from a man in his 70s who presented following several episodes of chest pain and dizziness.